If you’re looking for commentary on the coming presidential campaign, television has plenty of it. I’m not talking about the babbling bobbleheads that blather and snark across the alphabet ethersphere of CNN, MSNBC, and FOX. I mean the comparatively real stuff, the fictions that help us understand our collective reality. Sometimes those fictions amplify that reality, sometimes they modulate or focus it, but the underlying truth is always there—not in a top-down, Orwellian sense, but in a rendering of the zeitgeist. 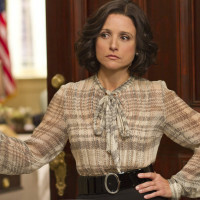 Whether it’s Julia Louis-Dreyfus’s President in Veep, Robin Wright’s First Lady in House of Cards, the political wife coping with a philandering husband in The Good Wife, the female Secretary of State in Madam Secretary, or any number of other offerings from Scandal to State of Affairs, TV can’t seem to give us enough examples of women with political power these days. But, if we look a little more closely, we see that while the appetite may be there for a woman in the Oval Office, significant challenges remain, challenges that may keep a woman, Hillary Clinton in particular, from being elected President. You can absolutely do two contradictory things at once. For example, I love my mother. But I had to put her in a home. And it’s actually better for her if I don’t visit. Whole cities of children were going to be saved from poverty. Instead now, that money is going to fund obsolete. Metal. Giant. Dildos. 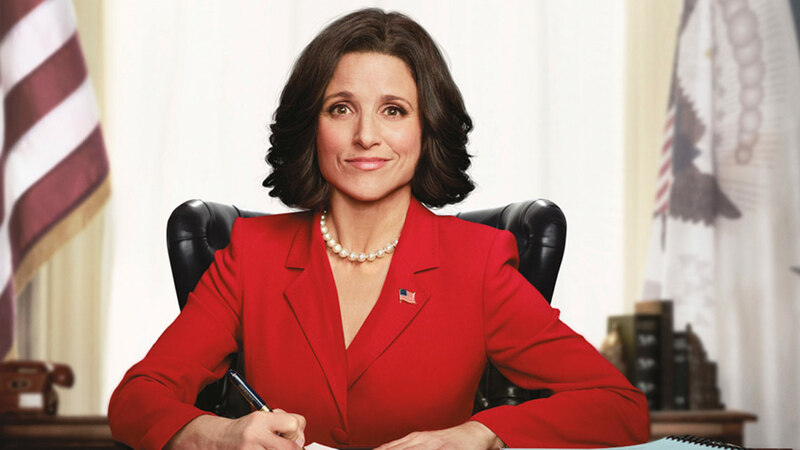 Selina Meyer is larger than life, and unlike Clinton, she’s a figure of satire. But the two women do share a significant, common problem: the feeding frenzy that public and press are engaged in over their personas. Though Veep often boils this problem down to insults, quips, and comic headlines like “Nightmeyer”, Clinton can’t dispose of her problems with the Fourth Estate quite so easily. In the real world, troubles with the press can be decades in the making, their impacts not so readily reduced to one-liners and summarily dismissed. Since Hillary left the State Department on February 1, 2013, the press has been waiting for her to declare her candidacy for president, practically begging her to run. Now that they’ve got her, they’re giving her the Selina Nightmeyer treatment, breaking a new pseudo-scandal every day. From the continuing adventures of Benghazi, to re-litigating the mistakes of her husband’s administration, email-server-gate, new-haircut-gate, Canadian-donor-gate, and being-snippy-with-reporters-gate everything Hillary says or does seems fodder for the press. Rather than pinning Hillary’s wretched press coverage to some sort of personal vendetta (or a vast right wing conspiracy), I see it as having to do with gender more than anything. Not that this makes it less of a problem. In fact, it’s more of one. In the same way that Obama was treated differently as a black candidate, Hillary has been and will continue to be treated differently as a female candidate. Her haircuts, her pantsuits, the size of her legs, whether she’s gaining weight… We’d all (men and women alike) be a lot more upset about this if we weren’t so conditioned to micro-analyze women’s appearances. Still, this is only one example of the double standard faced by female candidates, a double standard that may prove stronger than the idea of a woman in the Oval Office. Season three of House of Cards was a dark affair, one in which First Lady Claire Underwood forced her husband to install her as UN Ambassador, then proceeded to muck up international affairs something awful, sending her husband’s approval rating spiraling down the toilet. The season ended with Claire moving out of the White House, the world moving towards a state that began to seem apocalyptic. Though the Underwood marriage is so quintessentially political as to be satirical itself, it’s hard not to see Claire and Frank as the demonic (or at least Shakespearean) equivalents of Hillary and Bill. I’m not talking about today’s Hillary. I’m talking about yesterday’s Hillary, the successful attorney who came to D.C. with her husband in ‘92. Many of us remember the Clinton Healthcare Plan of 1993, when Hillary did her best to spearhead a comprehensive national health insurance plan nearly twenty years before Obamacare went into effect. The plan ultimately failed to gain traction in Congress, perhaps because at the time Hillary was perceived as being gifted her role as the head of the task force by her husband (a la Claire Underwood). This is a perception Clinton still deals with in spite of her service as Senator and Secretary of State. Though male politicians (Hillary’s husband included), seem to overcome scandals, to remake themselves with much more ease, we hold our female politicians, including Hillary, to a different standard. Until Hillary Clinton wins the presidency—and perhaps even then—her opponents will point to her husband as the engine of her success. The truth may be that at this point, Former President Clinton is more of a negative than anything. Yet still, we hear talk of a Clinton dynasty. Clinton’s critics, it seems, want to have it both ways: to style Hillary on one hand as some power mad overachieving robot, on the other as a skulking usurper attempting to take power by illicit means. In the end, the question isn’t whether there’s an appetite for female political power in America. There is. Television shows us that. The real question is whether this is tabloid interest or real interest, the sort that can propel a woman to the presidency, the sort of devotion that helped elect Barrack Obama. For Hillary Clinton, or any women to be elected President, she will need outsized support from other women, enough enthusiasm to counter the lingering disadvantages for any woman seeking the presidency. The sorts of double standards that may make for good satire, but not a fair society.